My beautiful little Possum is now over 15 months old. I absolutely have a toddler for a daughter now. No more baby! She walks! She talks! 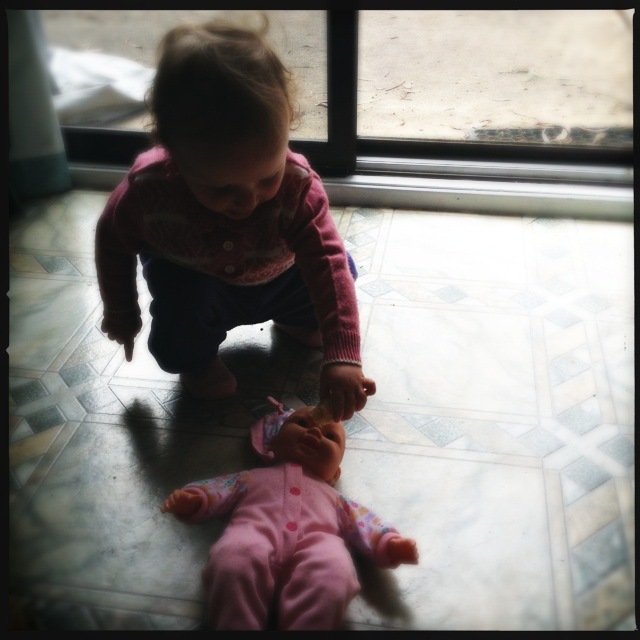 She tries to feed her baby doll! Before giving birth I always wondered how the heck I would manage parenting a toddler vs a baby. I know it’s very early days, but can I just say toddlers are awesome fun! Crazy, frustrating, hilarious fun 🙂 Much prefer them to babies at this stage. When Possum was 6 months old she grabbed a strawberry out of my hand and started to eat it. 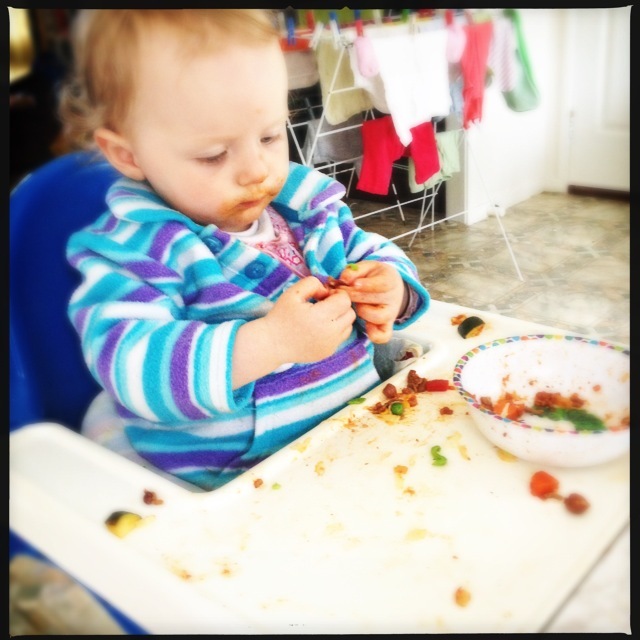 And so our Baby Led Weaning journey began. 9 months down the track and I wanted to take a moment to reflect on how it’s all gone thus far. Alot of people steer clear of BLW (Baby Led Weaning) because they think a) their kid will choke to death and b) that their bub won’t get enough to eat. I can safely report that Possum has absolutely had her fair share of gag moments, but has navigated them all safely. Once or twice I have swiftly gotten her out of her high chair to have her cough up the massive chunk of watermelon and then shove a new piece in her gob straight away. No tears, no stress. Just a little tot who loves her watermelon! In terms of not getting enough to eat, I breast feed Possum on demand which at the moment equates to about 3 feeds in 24 hours, 4-5 if she is teething or just having a rough day. She also eats three meals and has two snacks. With all of this she is only on the 10th centile for weight but is an otherwise healthy, happy and growing little lady. So what have been the wonderful things along the way? Watching her learn so much every time she eats. She now holds things up to her nose to smell them!! Seeing this makes me so so proud! In the early days it was the amazing fine motor skills that blew me away. How quickly she learnt how to hold and eat banana and avocado without mashing it all over herself. The way she can pick up a single green pea. The photos! So many great pics of smiles and mess and food and mushroom juice that looks like beards and avocado that looks likes dentures…. ah such sweet memories. The human peeler. The food goes in with peel. Mouth moves around. Peel comes out. Amazing. No pureed mush!!!!!!!!!!!!!!!!!!!!!!!!!!!!!!!!!!!!!!!! From day one, most of the things that Possum has been given, have been exactly the same as what we are eating. This has meant a bit of a shift in how we eat and how we plan our meals, but this has led us to be more prepared and also eat healthier throughout the week. It’s nice to see how she likes different foods prepared and what flavours she really enjoys. Easy to distinguish when they’re not all mushed in together. She can partially peel a mandarin!!! If you get her started she will do the rest. The other day she even walked over and put it in the bin (we may never see her do that again until she’s 21…). She also pulls the green leaves off her strawberries. Awesomeness. She will eat and entire pear. and I mean entire. She even tried to eat the stem one day. Generally she searches through the grocery bags to see what she can chomp on while I put stuff away. Hurray! It’s amazing how she isn’t fazed by stuff. Near choking experience… meh! Just shove more food in once it’s out! How the mess has gone from crazy to minimal. We use two wipes to clean up now. One for me and one for Possum to help (she says “wipe wipe wipe” when she’s finished and loves to help clean the chair, herself and of course my face!). Sometimes I don’t even bother with a bib! So wouldn’t have thought that was possible 9 months ago! Spag bol without a bib! It can be done! The friendly pair of Currawongs that comes to our garden to eat the remains from under Possum’s high chair. One only has one eye, I am particularly fond of that one 🙂 They aren’t scared of us now, so hang around while we are outside. Possum gets very excited to see them and waves and says “hi!”. It was so so worth it! So worth it. And Legoman totally agrees too. Some days I wished I had an open mouthed, spoon fed, garbage disposal unit. Oh how easy life might be….. Outings really were a bit tricky in the middle there. But we battled and got through and here on the other side it is much much easier. The mess. It’s a love hate thing the mess. It’s fun to watch. A bummer to clean up. We quickly devised a system. We use cloth wipes and kept a stash with the bib stash. We also went to op shops and stocked up on old tablecloths for under the high chair. We use a milk crate (just don’t tell the milk companies…) to put all the grotty wet wipes and tablecloths in and wash every couple of days. Worrying about weight. When Possum was only breastfed she was on the 50th centile. Now she is on the 10th. And we are all trying to figure out why! I wonder if the same thing would’ve happened had she been a spoon fed baby. But then again she is happy and her development is wonderful. Just has made me a bit of a worried mummy. Allergies. We are trying to figure out if Possum has an egg and possibly fish allergy. She came out in a rash after eating egg as well as having a massive vomiting episode after another meal of egg. Plus two other vomiting episodes after fish…. but then again she has also had fish and egg other times without any issues. Bamboozles my brain… Initial blood tests have all come back as normal so fingers crossed…. Just means no egg or fish at home. Poop. Two things I love. I am certain this would be the same whether we did BLW or not as there is such a strong family history of allergies unfortunately. 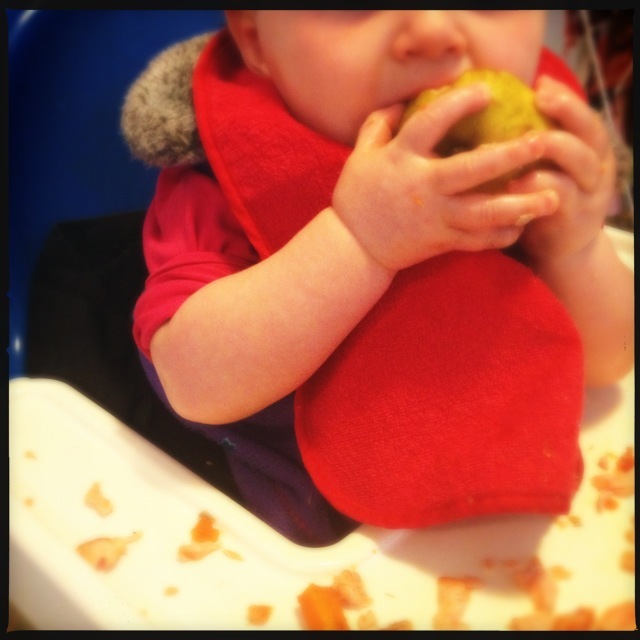 Sometimes I do feel a bit like a wanky parent saying “oh we did Baby Led Weaning (insert smug smile here)”. I went in to BLW thinking I would never have a fussy eater. How wrong was I. We have certainly had to battle a phase of not eating any vegetable other than mushrooms (random!) and being just a carb junky. But once again that phase passed. But be warned, BLW does not immunise against fussiness! And the big questions is… Has Possum weaned? No, not yet. And as long as I have this amazing milk making super power, and Possum keeps asking for it, then we will continue along this amazing breastfeeding journey we are on together. I am so proud of us for continuing despite newborn issues, blocked ducts, a breast abscess, returning to work and life in general. I would like to take a moment to say a massive thankyou to my wonderful husband for being a constant support. Without him I don’t know where I’d be. Thank you Legoman for being a rad dad!